On Monday, March 19, the Gallipolis Elks welcomed nine new members into the Gallipolis Elks Lodge. 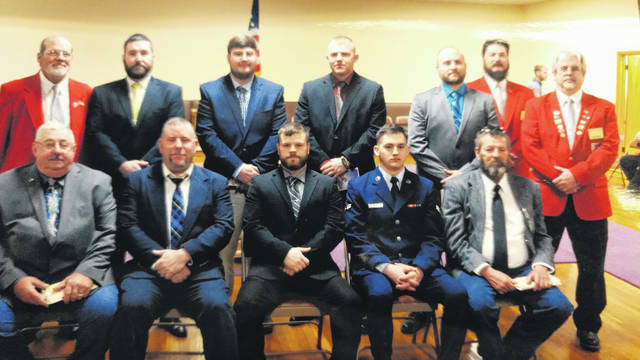 Pictured from left to right in the back row are Exalted Ruler Walt Brown, Roy Sayre, Seth Woodward, Seth Akins, Thomas Cook, Loyal Knight Bob McClaskey and Leading Knight Bob Marchi. Front row from left to right are Dean Martin, Donald Holcomb, Charles Hollanbaugh, USAF A2C Tristan Vance and Robert Shaw. The installation ceremony was performed by the Past Exalted Rulers Association with PSP Fran Mullen officiating.